I was involved with the creation of the band; sitting in on auditions, choosing names, designing costumes, and hobnobbing with my fellow wizards. Although the band played on the Tomorrowland stage, its creation and production was primarily a Music Company project. I recently discovered a personal notebook that contained a lot of conceptual artwork, so I scanned all the goodies and will post them here. 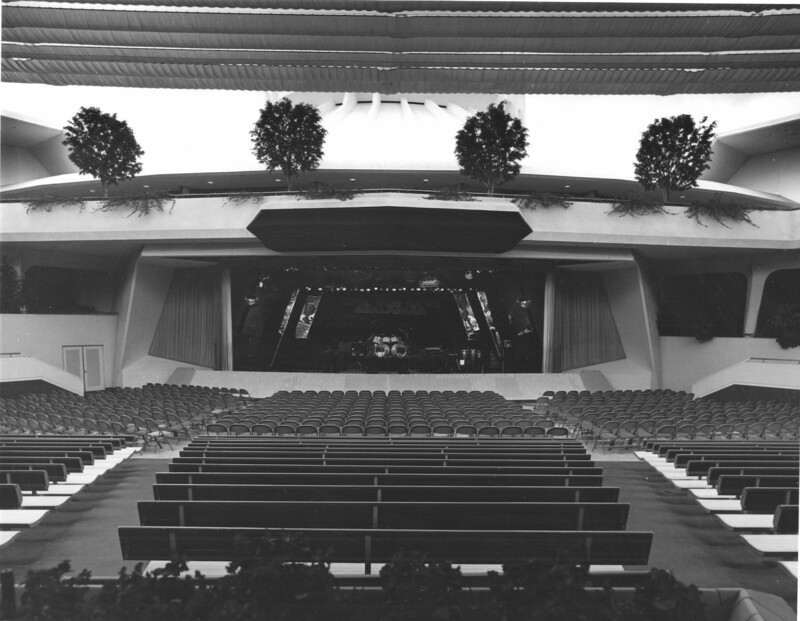 First up is a photo of the Tomorrowland stage. Who remembers this, huh? It was in front of Space Mountain, with seats and a dance floor. It was torn out to make way for the Captain Eo theater – which is now the Honey, I Shrunk the Audience show. 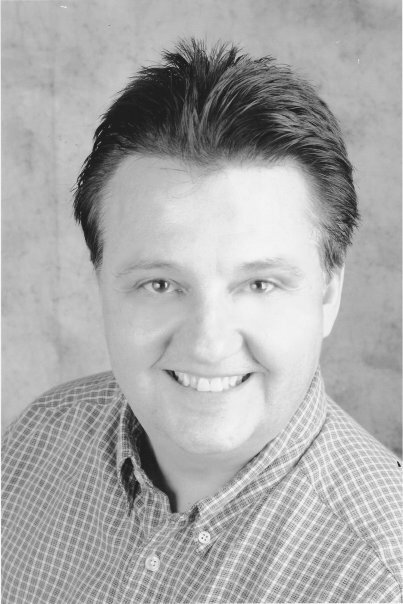 Let’s start with the keyboard player. One of the most static performers in any band is the keyboard guy, cuz he’s stuck behind a heavy piano or a rack of electronic keyboards. So we decided to make our player mobile by mounting the various keyboards onto a vehicle. 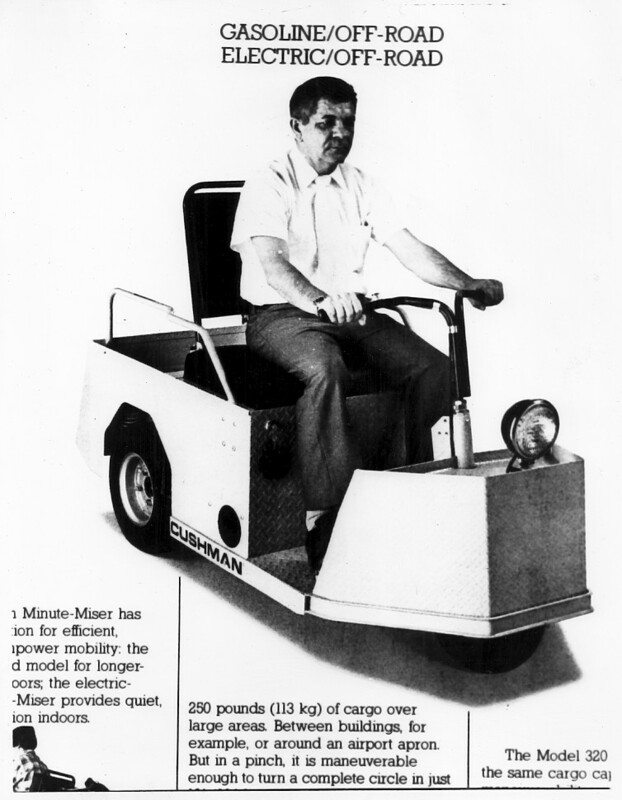 I remember looking at a lot of different golf carts and industrial carts. I’m pretty sure the model on the left is the one we decided on. I remember drawing up a rough sketch of how the keyboard (a Prophet 5, I think) would fit onto this cart and then meeting with a manufacturing company near the Burbank airport. This company was responsible for creating many of the floats for the Disneyland parades. They figured out how to make a framework around the cart to accomodate the instruments, then added all the sci-fi glitz, as well. The keyboard player (which was Tom Miller, the husband of Lora Mumford – the lead singer) could now move about the stage like one of the guitar players. But because Tom had to sit in such a confined space, he had to enter the cart before the show, then stay seated for the duration of the performance. 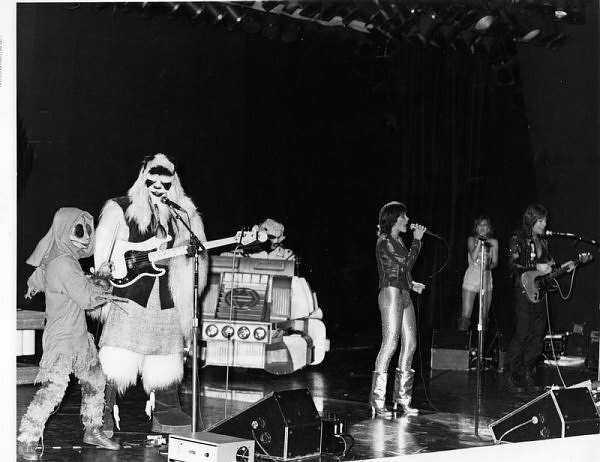 Besides playing keyboards and driving the cart, Tom also had the unflattering job of wearing a full body “stormtrooper” costume which obscured his face. He had to look through the visor of his robot helmet to perform. Weird. Here is another conceptual sketch for that costume. As I remember, Tom also has some bright cart headlights he could flash, and I think a fire extinqhisher that he could blast every so often. 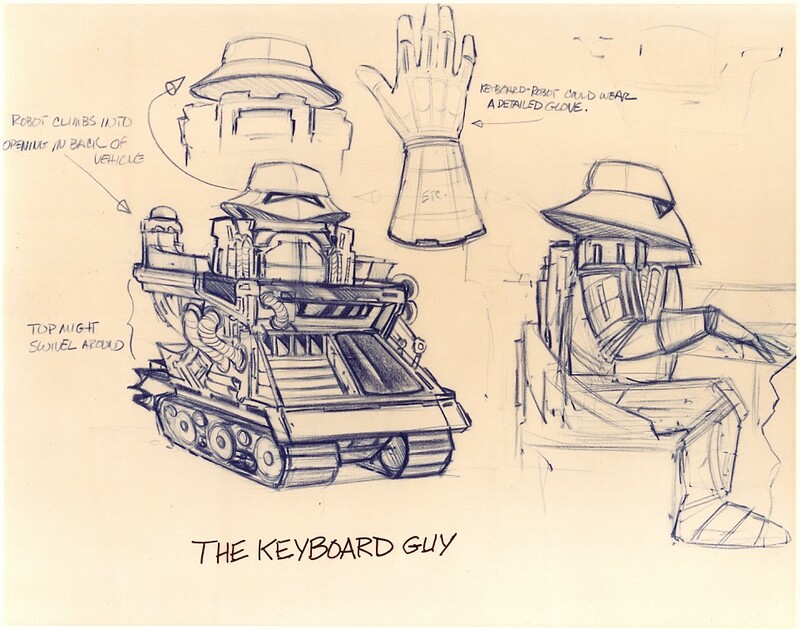 Anyway, it was a nifty little keyboard platform, and I wonder to this day if the dang thing is sitting on the backlot of Disneyland somewhere. 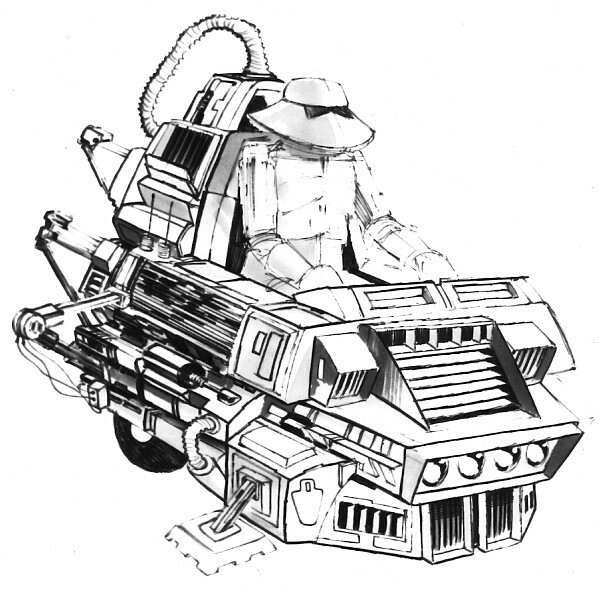 Here’s what the vehicle ultimately looked like. Check out this nice post done by the Imaginerding bunch that talks about the band, along with a nice quote from Bambi Moe (from the “Mousetracks” book). This explains a bit about Halyx’s never-saw-the-light-of-day album. Imaginerding: Disney books, history, links and more! : Halyx: For Those About to Rock…at Disneyland!